Located at the entrance of the South Campus is our three-story Lodge. The main floor houses 22 guests and the lower level has room for 18. Each floor has its own meeting room. The main floor also has a kitchen and fireplace for your use. A small group can rent one floor or a larger group can reserve the entire Lodge with 40 people. Rooms #1, #2, #4 and #6 contain a single bunk bed and a double bed (sleeping up to four people). Rooms #3 and #5 contain a single bunk bed and one single bed (sleeping up to three people). Room #7 contains two bunk beds, accommodating up to four people. There are 2 1/2 bathrooms on this level. The Lounge can comfortably handle a group of about 15 people. All rooms contain one double bed and a single bunk bed, accommodating up to four people. There are two large bathrooms on this level. Each one has two showers. 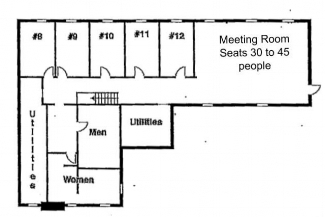 The meeting room will accommodate 30 to 45 people.